There are plenty of reasons as to why you should consider investing in the best hiking water filter, especially if you’re someone who enjoys spending a lot of time outdoors. From having peace of mind knowing that relatively any water source is accessible to limiting the amount of water weight you’ll carry with you, it’s about time you looked into these phenomenal preparedness tools. With every use, the LifeStraw Personal Water Filter will help remove up to 99.9% of parasites and bacteria from most water sources with its microfiltration membrane. It will eliminate some of the most common bacteria and parasites, such as Salmonella sp., E. coli, Cryptosporidium sp., and Giardia. Another interesting feature of its filtration system is that it also helps separate microplastics, which are microscopic pieces of plastic found in water due to littering. Also, in a single LifeStraw Personal Water Filter, you’ll be able to filter up to 4000 liters of water or 1000 gallons, giving you more than enough clean and safe drinking water for multiple trips. However, it is important that you properly maintain the device in order to get the most amount of filtration possible. 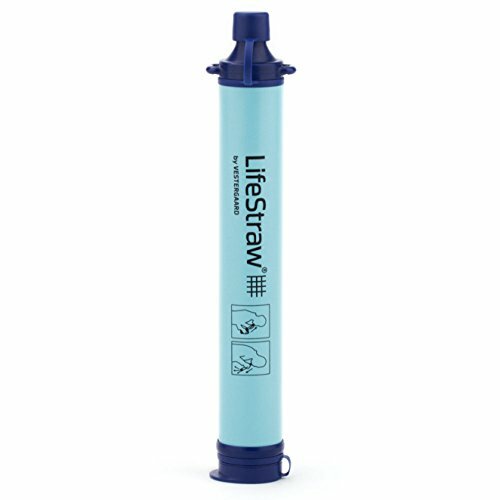 The LifeStraw Personal Water Filter is a convenient tool to have at your disposal since it filters bacteria, parasites, and microplastic materials out of drinking water. With that being said, it should not be used on polluted waterways as it’s not advanced enough to filter out human waste, toxins, or salt from oceans. Even though the device may take a lot of suction to start working, it produces clean and clear drinking water that doesn’t have any unappealing aftertastes, even when used in rivers off the beaten path. As another straw-like water filtration system, the Etekcity Portable Water Filter gives you the ability to take murky water and transform it into drinkable water. In this device, you’ll have a three-stage filtration system that will pre-filter the water, run the water through a carbon filter, and then through a membrane filter. Similar to other drinking filter straws on the market, this model helps remove up to 99.9% of contaminants including cholera, E. coli, Salmonella sp., Giardia, and Cryptosporidium sp. However, it comes with more accessories than other models on the market such as a folding water pouch, an extended drinking straw, and a syringe. The Etekcity Portable Water Filter gives every user the ability to filter up to 1500 liters of water, making it the ideal companion for weekend hiking trips. With that being said, you will need to make sure that you thoroughly clean the water filter and store it dry for the longest possible use. 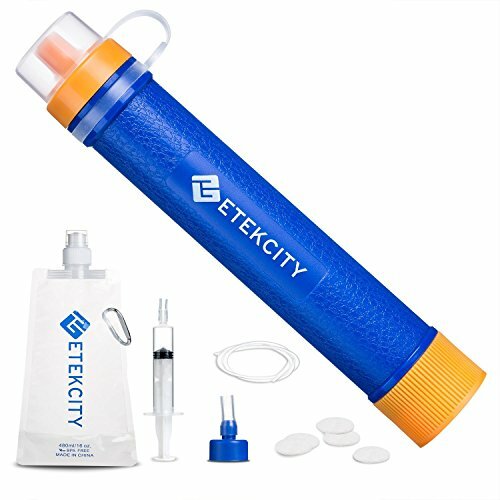 The Etekcity Portable Water Filter is a convenient tool to bring with you while you’re hiking, especially as it performs quite well when compared to more top-tier brands. After your first use, you’ll immediately notice that there won’t be any visible particulates in the water and it will taste quite fresh, even better than tap water in some instances. However, drawing water through the straw is tough which can cause you to exert a lot of energy in order to get the water you need. 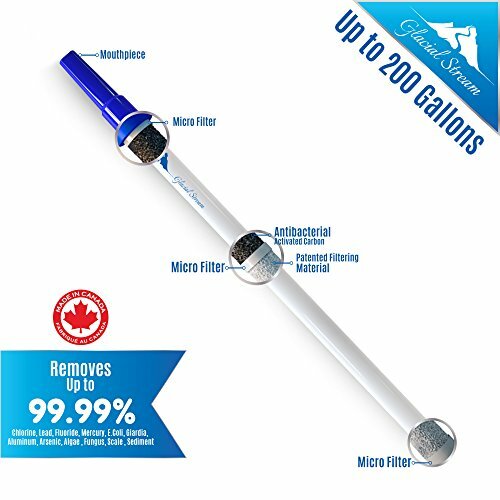 You’ll also appreciate the triple filtration system which helps get rid more bacteria and harmful components than other drinking straws on the market, giving you access to the cleanest water possible while you’re on the go. With that being said, you may notice that any contaminants might clog the filters, which can make it even more difficult to draw water. As another one of the great water filters that might become very important in the near future, the Glacial Stream Portable Water Filter is a convenient piece of hiking equipment that you should have in your rucksack. It’s a multi-purpose tool that is useful for eliminating up to 99.9% of contaminants from water ranging from heavy metals to sediments. There are three separate micro filters integrated into this drinking straw that help give you a safer drinking experience, especially as it helps eliminate more contaminants than other drinking straws that you can get your hands on. With the Glacial Stream Portable Water Filter, you’ll be able to filter up to 200 gallons of water or have six months of continual use. Also, it’s designed to be eight inches in length and 3/8” in diameter, making it the perfect tool that can easily be packed or carried in your pocket. If there’s one thing that can be said about the Glacial Stream Portable Water Filter, it’s that it creates great tasting water from something that may be heavily contaminated, although it’s not recommended for water that contains toxic pollutants aside from heavy metals. One thing you’re sure to appreciate about its design is how inconspicuous it is, making it easier to drink comfortably purified water while you’re on vacation, in restaurants, or even at a friend’s house. With its thin diameter, it’s something that can be stored in your pocket or purse and take up little to no space. Designed with the everyday person and outdoor enthusiast in mind, there are plenty of great uses for the Glacial Stream Portable Water Filter. For someone who is looking for the safest and least contaminated water they can find, it’s recommended that you use the Etekcity Portable Water Filter, as it’s clearly the best hiking water filter. When the purified water is placed under a microscope, you can tell that it has far fewer contaminants than when compared to other brands on the market. Also, you’ll immediately notice how clean and fresh the drinking water tastes once it’s filtered. Even though the Etekcity Portable Water Filter might not filter as much water as other models, the fact that it gives you up to 1500 liters of filtered water is phenomenal for the type of person who hits the trails on a regular basis as it equates to over a year of daily use. Another benefit is that this straw filter is easier to use than with other models that make it difficult to draw water. As long as you follow the initial setup instructions, you’ll be able to drink water from relatively any source you come across, giving you the lifesaving features you would expect from your hiking and survival gear. How Do Water Filters Work and Some Essential Tips How to Filter Water in the Wild: Finding and Drinking Safe Water Anywhere Survivor Filter PRO Review Sawyer Products MINI Water Filtration System Review What’s The Best Way To Carry Drinking Water While Hiking?